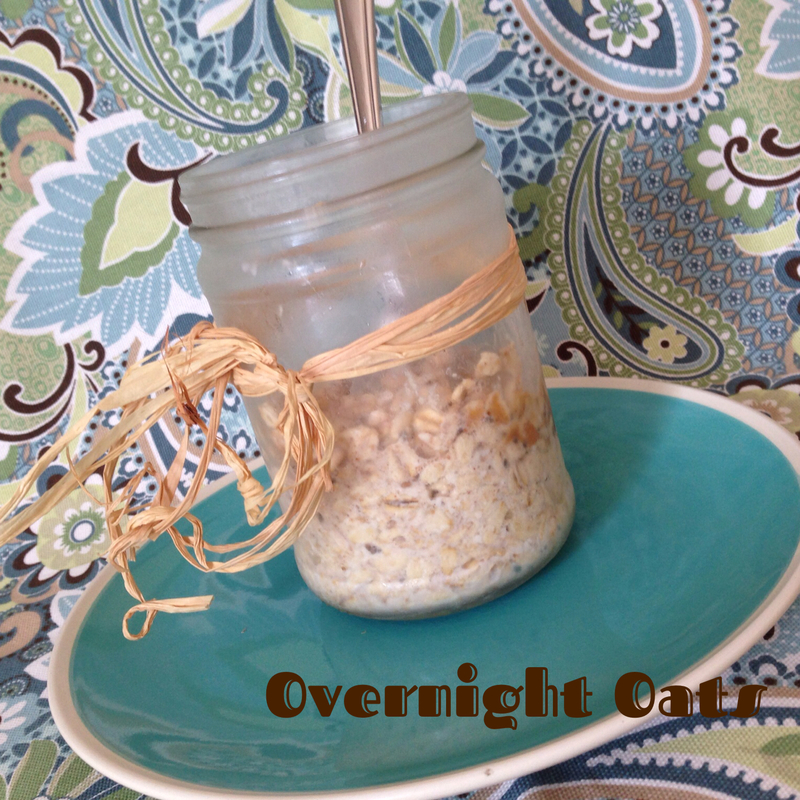 Wake Up to Overnight Oats! 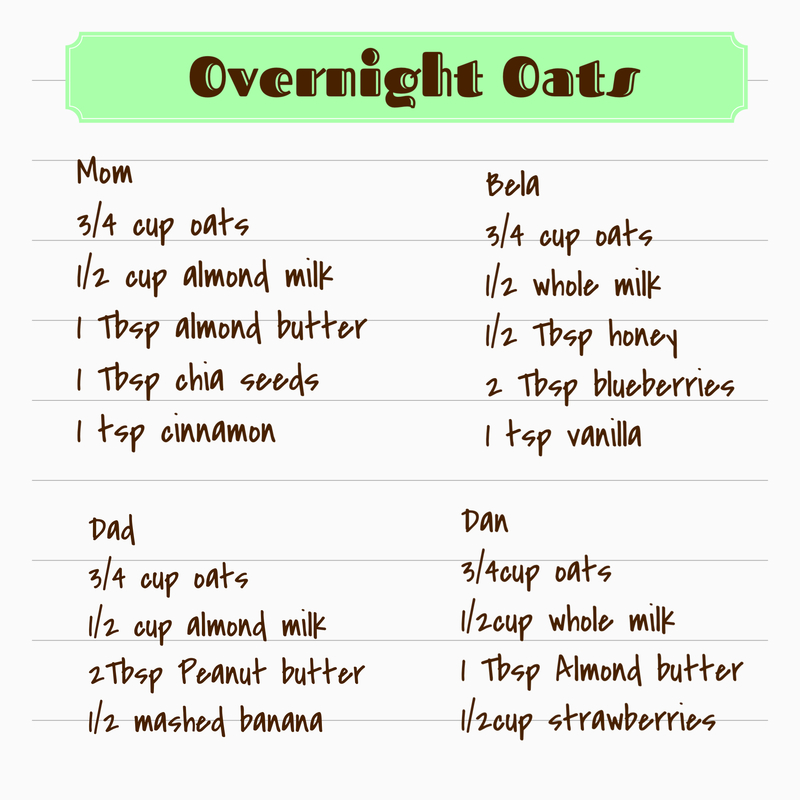 I have seen several bloggers post numerous recipes for “overnight oats” but I must admit I hesitated to the whole idea until about a week ago. I have been in search for ways to use some of my glass jars that I usually just dump into the recycle bin. In my leisurely search in Pinterest I came across the idea of using the peanut butter glass jar to make overnight oats. What really caught my interest was that instead of soaking the jar with water and detergent to clean it when all the butter was gone, I could just add the overnight oat ingredients to it as is and REALLY use up every last drop of nut butter! I’m a huge advocate for “short cuts” that make your life easier when it comes to cooking. My mornings are way more rushed than I ever imagined they would be. I remember the days where I stretched out in bed and took some deep breaths contemplating what this next day would bring… nowadays I pretty much open my eyes to breakfast orders, homework help requests, reminders of lists I need to complete, and checklists of afterschool activities we must prepare for. Sure I could set an alarm and wake up 30 minutes earlier to give myself extra time, but that would mean waking up at about 4:30 am! Needless to say this whole “overnight oats” thing really was a perfect fit for my morning routine. Breakfast that was prepared the night before and actually gives me a reason to smile as I jump out of bed. I can’t believe I took so long to try it! Some other side benefits were that my kids really enjoyed helping put them together the night before. The idea of having “personalized” breakfasts for the next day convinced them to belly up to the counter and pick their own ingredients. I used some of my many Once Again Nut Butter jars that I’ve been saving since they have a nice airtight lid and are the perfect size. And if I get around to it this next weekend I might even paint the name of each one of our household members to the jars (Oh, if you know some good techniques for painting on glass let me know, that will be my next Pinterest search!). The sky is the limit when it comes to “Overnight Oats” recipes. The main ingredients are a ¾ cup of old fashion oats of your choice, ½ cup milk of your choice (we used almond milk, unsweetened) and 1 tablespoon of Once Again Nut Butter, then you add your toppings. Close your jars and place it in the refrigerators overnight (or at least for 1 hour). That’s it! It will be ready to enjoy the next day, you can always add a little extra milk if it’s too thick the next day. My husband’s version has an extra tablespoon of nut butter since he eats breakfast pretty early and doesn’t usually get to lunch until 1pm. My egg-and-toast-man wasn’t too sure about this oatmeal in a jar either, but after a couple of days where he actually endured his morning meetings and made it to lunch without a headache he was convinced too. My kids preferred theirs with lots of strawberries and blueberries, while I added some chia seeds and cinnamon to mine which reminds me of the more traditional oatmeal I used to eat as a child. You can eat it cold right out of the jar in the morning, which during the summer just makes more sense. Or you can also warm it up for a few minutes if you prefer it that way. Have fun creating your own favorites! Top 10 summer time activities to enjoy as a family! I actually take these to work with me every morning but use 3/4 c oats, 1 cup of almond/coconut milk and then vary the toppings (tahini, nut butter and fruits/seeds, etc.) They sometimes get a pop in the microwave, but in the summer I like them cool. So easy! Looks delicious! I will definitely try! Tahini in oatmeal is my favorite with just a spoonful of honey, super yummy! Pumpkin! I like to add yogurt peanut butter and a bit of cocoa powder and honey for my overnight oats. This sounds like a great idea. I’m always in a rush in the morning and sometimes don’t have enough time to make my oatmeal. This way, I can grab it out the frig, and take it to work and heat it in the microwave. Thanks for posting this, I’m going to try it right away!